Are You Using the Right Toothbrush, Long Grove? We all know that it’s important to brush your teeth at least twice a day — but how do you know if you’re using the right toothbrush? At Long Grove Dental Studio, we think it’s important to not only keep up with brushing your teeth, but also to make sure that yo u know what makes a good toothbrush, and that you’re using the right one. 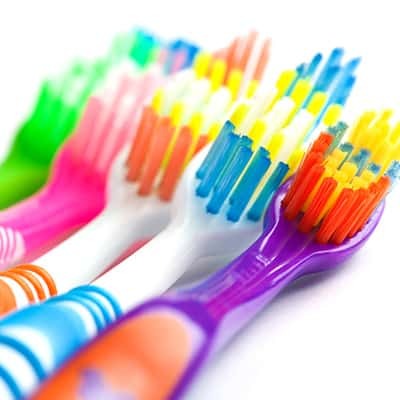 Toothbrushes come in a variety of sizes to accommodate different mouth sizes. For larger mouths, a full-head toothbrush may be preferred whereas if your mouth is smaller, you may opt for a compact head or even a youth toothbrush. Either way, your toothbrush should be able to fit in your mouth comfortably and allow you to easily reach all areas. The handle of your toothbrush is also an important component to consider. While it’s important that the shape of the toothbrush is comfortable for you, it’s also necessary to make sure that the handle length and shape allows you to fit the toothbrush easily into your mouth and back to your molars, maintaining steady control. While certain aspects of choosing a toothbrush are personal preferences, like size, shape, and color, other parts of a toothbrush shouldn’t be so subjective. The type of bristles a toothbrush has is directly related to how well your toothbrush is cleaning your teeth, without causing damage. Long Grove dentist Dr. Nicole DeMars recommends using a soft-bristle toothbrush, not only because it bends more easily to reach those hard-to-reach places, but also because it is less damaging than hard bristles. Hard bristles can cause gum irritation and may even cause damage to the tooth surface. At our dental office in Long Grove, we not only recommend using a toothbrush that has the American Dental Association (ADA) Seal, but also maintaining regularly scheduled hygiene visits and check ups. If you’re due for a professional dental cleaning, give Dr. Nicole DeMars a call today. We love to see you smile!